As Brian and I drove into the hospital grounds, the sun was just coming up in a bright new dawn. We greeted the security guards at the entrance and we realised that we were now following a pattern each day. Those early morning drives to Busamed Gateway Private Hospital had become time to discuss what was still to come and make a list of research we could do during the day. Medical personnel often discourage you from “googling” your condition, as you end up reading about the worst case scenario which is presented as being normal. However, we have always done research on our boys’ medical issues (The Mayo Clinic site is a useful start!) and then we ask the doctors how something fits into our situation and what the possible effects could be for either of our boys. 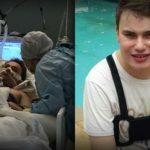 Having said that, we also know that Matthew had never strictly followed any normal “pattern” of recovery during his previous surgeries, which made us think this may be the case here too. We realised that with transplants, it was expected that there would be glitches and things to be managed and corrected. This day was one of those days. We arrived to find Matthew somewhat down. This mood swing could easily have been because of the medication. 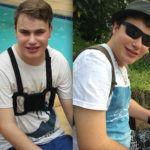 However, he had been put back on oxygen overnight and this felt like a step backwards – like the surgery had not worked. It turns out that a side effect of one of the anti-rejection medications is that it attacks the bone marrow and affects blood cell production. 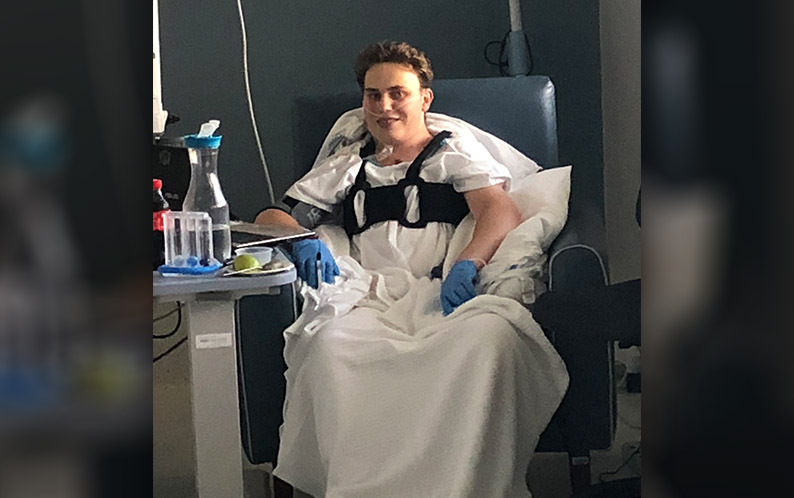 As a result, the body was not replacing his Haemoglobin (the “carrier” of Oxygen around the body) fast enough, and with a reduced HB count, he needed more oxygen to maintain his blood oxygen levels. 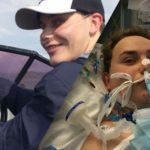 His immunosuppressant level also hadn’t increased as it should have, but we later found out how this worked – it’s a complex chemical balancing act to get the best for the patient. 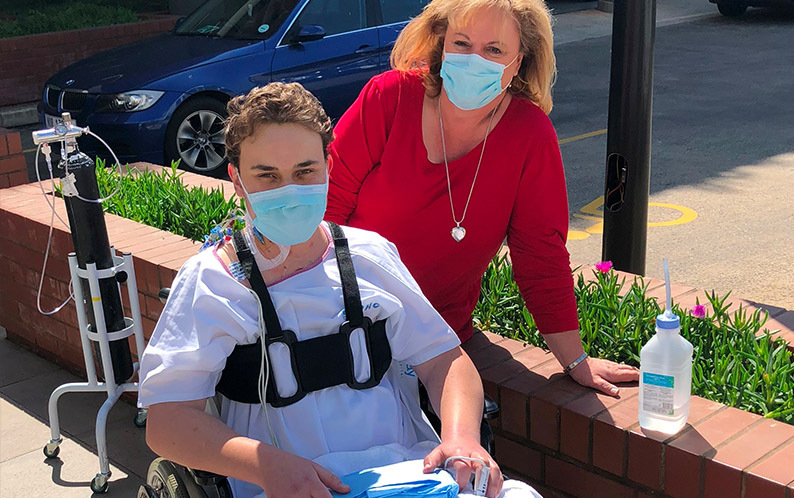 We kept praying and believing for Matthew’s complete healing – for everything to fall into line as it should be – so that we could take Matthew home to continue his healing there. 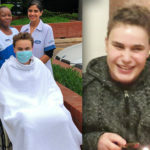 One thing we only found out recently, even though Matthew had been waiting for seven years for his transplant, was that psychologically having a transplant can also be very hard on the recipient. We tend to think that they would simply be grateful for the second chance at life and get on with it. In reality, it takes some processing of the situation for them too. Weeks after coming home, Matthew often talks about the donor family and asks many questions, many of which we don’t have answers for. One of the other challenges is the mind-set shift that the recipient is no longer “sick” but normal like everyone else. 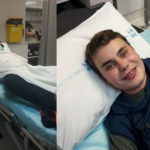 Matthew was quite cheerful this morning and his physiotherapist had him out of bed again. He hadn’t been able to walk yesterday and he had done what we began to call the “Matthew shuffle” again today. (a short shuffle). Danika left Matthew sitting in a chair with express instructions to stay there for a couple of hours! By mid morning we hadn’t seen the doctors and were eager to find out if they had pinpointed the reason why Matthew was back on oxygen. Knowing that it could be because of a myriad of reasons was frustrating so we could only imagine what it must be for his carers if they couldn’t pin point it. 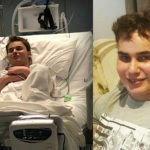 We knew the lower than normal Haemoglobin could be an issue and that the anti-rejection medication could also be messing with Matthew’s bone marrow and the production of the blood cells that carry the oxygen around the body. It was and continues to be quite a balancing act to make sure one medication doesn’t affect another or cause him to go into rejection or liver or kidney failure. We really were looking forward to having our transplant training so we could have a better understanding as to what we should expect in relation to Matthew’s transplant, what they were continually looking at and assessing and what we needed to keep a check on when we finally got home. Many of our questions included things like: What does he need to do differently? How important is it that he takes his mediation on time? Does his diet need to change? OH YES!!! He will need to eat vegetables and fruit! Does he really have to drink THAT much water? What isn’t he allowed to eat? When can he have friends over to visit? When can he go out? Where can he not go etc.? We knew the answers for many of the questions, but waited till after our transplant education to answer the rest. Our biggest concern then, was to ensure that we had done everything we can to give him the best possible start post transplant. By evening we were again reminded that a transplant journey is definitely a roller coaster ride. Matthew was spiking a temperature and his blood tests weren’t looking as good that night. This wasn’t good news for Matthew as he really was intent on staying on track so that he could come home. Post Transplant Day 15 ( T+15) was a really slow day. By now Brian had long since been going to work during the day and popping in at visiting hours to see Matthew and then coming to sit with me until we left at 21:00 each night. This was possible as his office is only a couple of blocks from Busamed Gateway Private Hospital. I often sat for hours writing or trying to read and I drank copious glasses of Coffee Freezo’s! It took a while for the morning’s blood tests and cultures to come back as we waited to get feedback from the doctors. Matthew was more himself but the broken record of “when can I go home?” was in full swing that morning. His day was interrupted when the physiotherapist got permission to take him outside in a wheelchair to get some sun. What a lovely time Matthew had just sitting outside in the sun. The morning was made even better when we heard that an acquaintance of ours was in surgery at that moment receiving a transplant. Vanessa, the Unit Manager of SICU, and I also enjoyed being outside and watching Matthew thoroughly enjoy the sunshine. He soon commented on how bright the colours were around him. I later found out that this was likely due to him receiving his transplant as somehow the brightness of the colours he sees may be improved after transplant. We got here this morning to hear that Matthew may be able to go home soon only to have the bubble burst a couple of minutes ago, when the Doctor told us he was putting Matthew back on CPAP for 10 minutes every 2 hours as his lungs are a bit murky in one area. Matthew was also not able to move the phlegm building up in his throat as he wasn’t allowed to cough from the chest and hadn’t yet mastered the art of coughing without doing so. I wondered if it was better not to get our hopes up about taking Matthew home but to wait until we get a definite yes from the doctors. 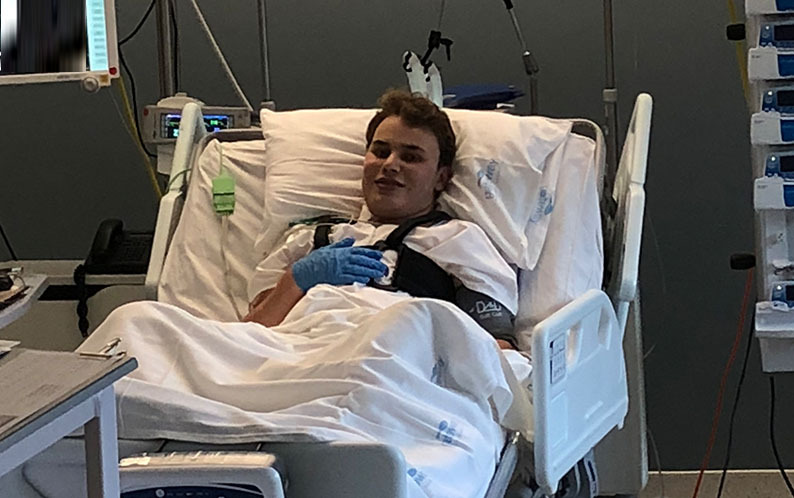 We were grateful to everyone for their care of Matthew and really didn’t mind the wait to go home as we were so aware that every possible complication needed to been eliminated before we went home. By late afternoon we were told that the surgeon had ordered a CT scan as he was concerned about the milky colour of an area of one lung. 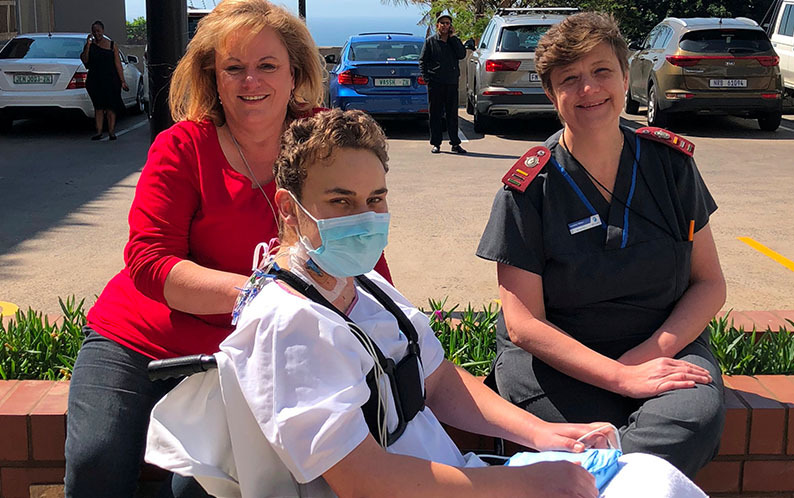 It turned out there was fluid build up around the lungs so Matthew was scheduled to go to theatre the next morning to have a procedure under local anaesthetic. The doctor would put in two cavity drains which he expected would only be in for 24 hours. 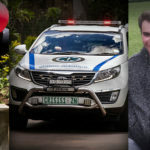 On top of this, Matthew was seen by the neurologist who was investigating the leg/nerve issue and it was agreed thereafter that Matthew have a splint fitted to aid in his walking. He mentioned Matthew would require extensive therapy on his leg for the next 6 months (oh boy!). 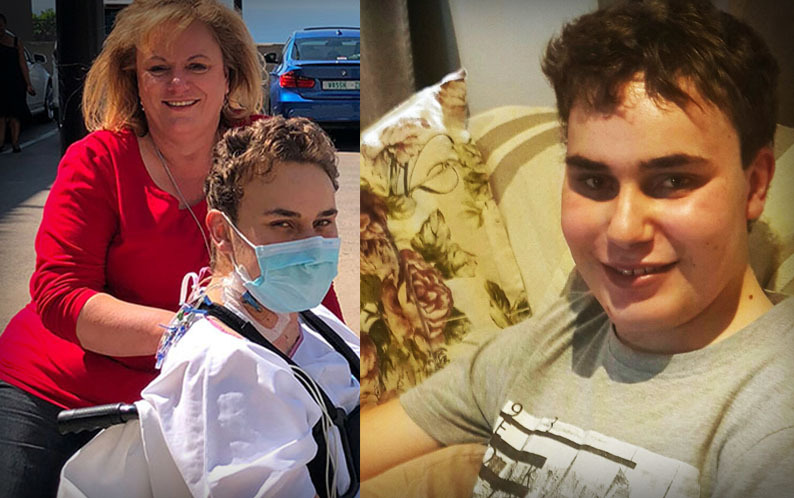 Our chats with Matthew now revolved around what he had been through, what Cindy was saying (he asked every time we went in to see him), who had messaged him and just how miraculous the whole process had been. He wanted to know exactly what the doctor or Cindy were telling us, that included all the extra information about what happens when he leaves the hospital, how often he needs to come back for checkups, what blood tests he has to have, how much medication he will be on etc. He was and still is awed by God’s grace. Every evening before we left to go home, Brian prayed with Matthew who had a list of things to pray for which often included the sisters, other patients and his anxiousness about the leg.